South Idaho contains many signs of ancient volcanic activity, all across the Snake River Plain, which is a great arc of flat lands south of the Rocky Mountains, bordered in the southwest by the Owyhee Plateau and to the southeast by basin-and-range terrain. The valley and the volcanism result from westwards movement of the North American Plate over a large, stationary plume of magma, so that the volcanic features become more recent further east; the current center lies beneath Yellowstone National Park in Wyoming. In Idaho, the most varied and extensive lava flows are contained within Craters of the Moon National Monument and Preserve, located in a very little settled region of the state between Arco and Shoshone. Features here are associated with the Great Rift Zone, a series of faults, cinder cones and other vents extending north-south for over 50 miles, surrounded east and west by vast, largely featureless lava fields. Although the most recent lava is around 2,000 years old, the rift is still geologically active (dormant rather than extinct), and future eruptions are likely. The protected area is divided into several parts, centered on a small, developed section which are found a 4 mile scenic drive, a campground, a visitor center and several short trails. The adjoining lands to the west, south and east are part of Craters of the Moon Wilderness, stretching about ten miles, and these two regions are managed by the NPS as a national monument. The overall boundary of the preserve is much larger, extending 60 miles north-south, and including the Wapi Flow, a detached section of lava near the Snake River, at the south end of the Great Rift. This wider area includes some lands under NPS control as a national preserve and some managed by the BLM as a national monument. The developed, NPS national monument is accessed by US 20/26/93, a major cross state route and a shorter alternative to I-84/I-15 for travel between Idaho Falls and Boise, Idaho's two largest cities. For over 50 miles this highway runs at or close to the north edge of both the lava flows and the Snake River Plain, bordered to the north by the grassy foothills of the Pioneer Mountains. 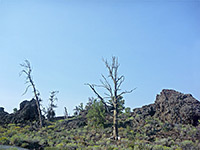 The majority of the lava has low relief and is rather overgrown so the rocks appear more green than black in color, but the central section (within the NPS national monument) is darker and less vegetated, dotted with prominent cinder cones and ridges. The side road to the monument passes the visitor center, entrance station and 51 site campground (no hookups), then continues south through the lava for 4 miles - see map. Although the monument is open all year, the road is not plowed much past the entrance, and it closes in winter due to snow, usually between mid November and mid April. Free, primitive camping is available along lesser roads branching off Hwy 20, such as 3.5 miles west, where a narrow track heads north, right beside the edge of the lava flow, winding into the empty hills. The park road first reaches the parking area for the North Crater Flow Trail, the most popular in the national monument since it is short, and close to the entrance. Signs along the way explain some aspects of the local geology. A longer but better hike begins just south; the North Crater Trail climbs past several well preserved craters and patches of lava for 1.8 miles, to an alternative trailhead at the Spatter Cones, another popular area. 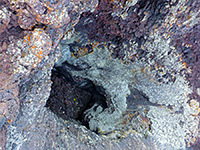 The cones are small vents formed by very fluid lava, which when ejected fell back in irregular lumps, forming jagged piles around the openings. Today, the rocks have the rich colors of red and purple, augmented by green and orange lichen. 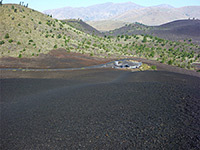 The very short path to the spatter cones is paved and wheelchair accessible, as is the half mile Devils Orchard Trail, which crosses a party vegetated landscape of ash and lava. 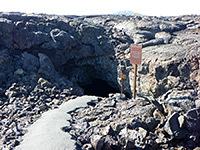 There is one other popular path, also paved - the Caves Trail across a field of pahoehoe lava, completely lacking any vegetation, to a junction beside a short lava tube (Dewdrop Cave), where it forks. The north branch passes two more caverns, Boy Scout Cave and the larger Beauty Cave, where a short descent reaches a smooth, flat floor, but the accessible portion ends soon after; a narrower continuation passage is fenced off. The other branch of the trail heads south a little way to Indian Tunnel, a partly collapsed cave that has a few short intact sections but can still be explored without flashlights. This is the largest and most impressive of the four caves, with a high ceiling and colorful lava blocks along the walls. All four are a rather short, however, compared with lava caves in other locations such as Lava Beds National Monument in California and El Malpais National Monument in New Mexico. A lesser trail once continued 2.5 miles east to a larger group of caves but this area is not currently open. 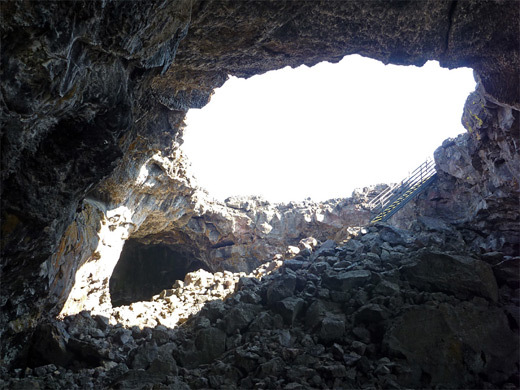 Underground exploration in Craters of the Moon National Monument requires a free permit, obtainable from the entrance station and accompanied by warnings about the resident bats, who are under threat from a fungal disease. The national monument contains three other easy trails, all less busy. 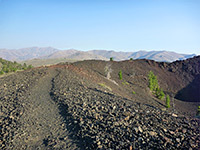 Inferno Cone Trail has a short, steep climb to the summit of a black ash hill, giving good, elevated views of the surroundings. Broken Top Trail loops around another cinder cone, also passing lava flows and lava caves. The 2 mile Tree Molds Trail crosses grassy ash deposits to some casts formed when molten rock enclosed a group of trees, which decayed after the magma cooled to leave the cavities. 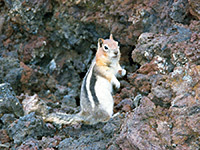 The national monument also has one longer hiking route, the Wilderness Trail, which forks south from Broken Top, heading southeast over fairly flat land, descending gradually past several cinder cones and other volcanic features. The usual day hike destination (4 miles) is the summit of Echo Crater, a red-topped, crescent-shaped peak, but the path continues another 1.5 miles to the larger and more symmetric cone of the Sentinel. Other sites are reachable via cross-country hiking - relatively easy as there are no jagged flows of aa lava hereabouts; nearby features include a series of deep, narrow cracks a short distance east, this being directly above the Great Rift Zone.